The Sunshine Coast is a region bordered and nurtured by the sea. 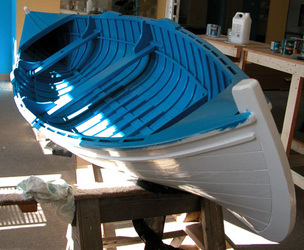 Naturally, boat building and fishing have always been a part of life to its coastal inhabitants. Before the 1930s, there were so many salmon in the waters of the Sunshine Coast that the average fisherman believed stocks could never run out. Upon arrival of European settlers to the area, most men took up some form of fishing, whether it was hand trolling, gill netting, or seining. Salmon were sought in every local inlet, with the most prized fish being sockeye and coho. Popular fishing locations included Salmon Rock, south of Keats Island, Cape Mudge, Blubber Bay, Poverty Point, Dinner Rock, and Rivers Inlet. The fishing fleet in the Depression years grew dramatically, aided in part by the arrival of transients from off coast. At a time when employment was scarce and goods were costly, fishing provided at least some form of income. Shorelines were dotted with tents and driftwood shelters from these newcomers. Between 1935 and 1950 almost every large fish company had a camp in Gibsons' bay during the fall season. The sight of hand trollers numbering in the hundreds was once a common sight between Alaska and Oregon, with a major concentration of activity in Georgia Strait between 1900 and WWII. Unfortunately very little photographic evidence remains of such fleets but the museum has several examples in its photograph collection. In an interview conducted by the museum, fisherman Ben Vaughn recalled: "...everybody had rowboats and everybody hand trolled...nobody made much money cause there was no price for the fish, although there were lots of fish." The occupation ultimately did not provide a reliable living wage due to low buying prices. Even experienced fishermen could end a season with a mere few hundred dollars. In the 1920s, coho salmon yielded four cents a pound, and two cents for spring salmon. Pioneer Harry Corlett stated that if he could clear one dollar per day he could get by. Gradually the yield of Howe Sound lessened and most gill-netters left fishing for more continuous employment. Fisherman Ben Vaughn recalled that when it came to transportation on the coast "most people used [boats] like you'd use your car, because there were no roads up in that country and if you went anywhere you went by boat." 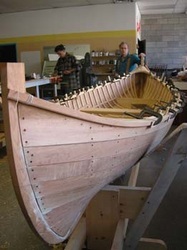 The double-ender was ingeniously designed as both a mode of transport and as a fishing vessel: It would loft with the waves and set down gently, its heightened bow kept water off the rower, and it launched easily over logs and onto surf. When being rowed, waves parted and closed behind the boat - creating a smooth undisturbed wake. 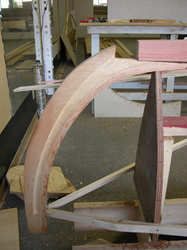 The 90 degree twist in its garboard plank gave it a shape that rowed well, and a fisherman could cover thirty miles with relatively little effort. Indeed, it was designed to troll for salmon entirely under the power of a single person. The majority were designed and built between 1900 and 1939. Prevailing wisdom was the 14'7" matched the harmonic distance between the typical wave peaks of the Pacific coastline. The speed at which the boat could move was governed by the square root of the waterline length. Of the hundreds that once existed, only about a dozen have survived to this day, and the majority of them are from the Sunshine Coast. In fact, fully one quarter of the boats originated on the Sunshine Coast. The museum is proud to house one of the last remaining double enders from the 1930s handliner fleets. Built out of cedar planks, yellow cedar ribs and copper wire nails, it dates back to 1934. 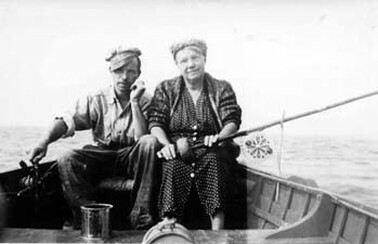 Its builder, Hubert Evans, was a respected Canadian author whose fishing supported his family and enabled them to survive the Great Depression. 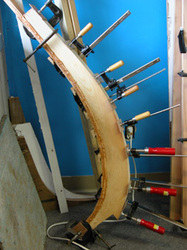 Evans' Georgia Strait Handtroller was built by hand out of beachcombed logs for a grand total of forty-two dollars. 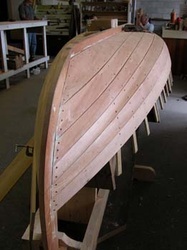 The 14 foot, 7.35" carvel hull was equipped with a sprit, mast and sail and was used extensively for commercial salmon fishing from 1934 to 1942. It would troll easily at three miles per hour and a sprit sail was used to travel longer distances. Also included in the display is Evan's handmade herring rake, a common device for fishermen of that era to catch bait. The rake would be swept into the water in much the same motion as a canoe paddle, and was meant to snag herring right out of the water. The spikes were often made out of reused materials - either previously used nails which had been straightened back into shape, or form old safety pins that had been broken in two. 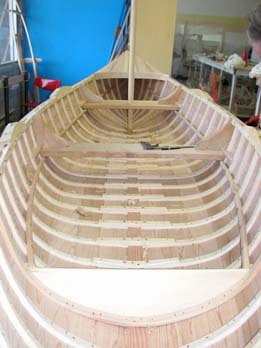 Evans' boat included a yew dip net, selected for its strength and flexibility, and a bamboo fishing rod. 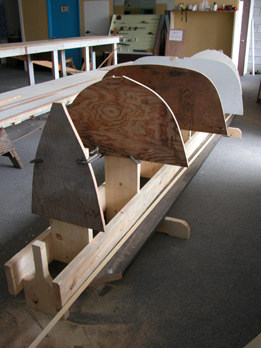 In 2005 the museum realized its goal of building a replica handliner and rowing it along traditional fishing routes in local waters. With the generous assistance of sponsors and community volunteers, Davis Bay boat builder Larry Westlake was contracted to oversee construction of the boat, using traditional methods and materials. He was also contracted to produce a detailed set of boat plans, which are available in the museum gift shop. 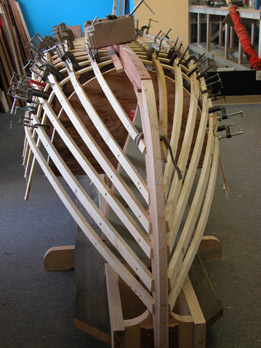 The Bank of Montreal in Sechelt donated display space, where the public was invited to watch the building process and even to take part in the boat's creation. Other forms of support for the project came from the Government of BC, Howe Sound Pulp & Paper, the Sunshine Coast Community Foundation, Prudential Sussex Realty, Sunshine Coast Forest Products, Sunshine Coast Credit Union, Home Hardware and the Traditional Small Craft Association. The replica was launched on July 30th and, accompanied by other handliners and small wooden heritage boats, began a two week migration journey to Lund, stopping at traditional fishing sites. The boat also made an appearance at various communities that have a history of handliner fishing such as Gibsons, Sechelt, Pender Harbour, Powell River and Texada Island. The Handliner Replica project has revived an interest in traditional boat building and resulted in the creation of handliner replicas worldwide. 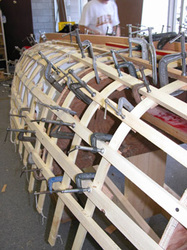 View our photo gallery of the handliner replica construction below.